I’m a sucker for pretty decorative pillows on the bed and sofa and all my decorating projects usually include several that I’ve handmade specifically for that project. There is something very special about one-of-a-kind elements in a room. Pillows are also a great way to switch out colors and styles without breaking the bank. 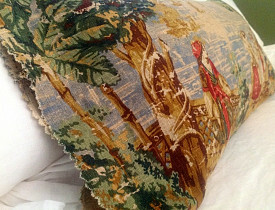 Interior decorators working on even the most high-end projects will routinely use the most expensive fabrics on small items like pillows in order to stretch the dollars as far as possible. While many home stores carry loads of inexpensive pillows, it doesn’t take big DIY skills to make your own, or customize a basic pillow from a store. While I am capable of making quite ornamental pillows requiring decent sewing skills, sometimes I just want a quick and easy change. I recently made a cover for an existing oblong 10x18” pillow by taking a sample of a fabric I like and sewing a single seam in the fabric to make it a “tube” into which I inserted the existing pillow. The pillow ends were cut with pinking sheers to reduce unraveling and I left them “raw”. The quickest five minute pillow going and when I want something different, I can just pull the fabric off and slip on something new. The best part of this project is that I could have done it by hand if I didn’t have a sewing machine. If your sewing skills are completely non-existent, have no fear - there is something just for you on the market. The June Tailor Decowrap No Sew Pillows come in three shapes: round, square and oblong bolster and come with small cuts in the foam which allow you to wrap them in fabric and tuck in the ends. I have tested the bolster and it worked very nicely and was quite snug and secure. A great way to get a customized look without the need for sewing skills is to decorate a plain fabric pillow cover with purchased ribbon or decorator trim, available at any sewing or crafts store. Using a hot glue gun, craft or fabric glue, afix the ribbon trim to the pillow in a pattern or simply frame in the outer edges of the pillow. It’s a great look and couldn’t be any easier. You can also create a simple fabric pillow cover by cutting two pieces of fabric to your pillow size plus 1” seam allowance all around. Use Stitch Witchery, a narrow fusible bonding web available at any sewing store, to adhere the two sides together within the seam allowance, leaving one of the ends open. Insert the pillow into the opening and then close up the opening with the Stitch Witchery. If you tire of the fabric cover, simply cut off and make a new cover. Linda Merrill is a Boston-area interior designer who works with Boston garage door contractors and remodelers.